Vice President Joe Biden on Thursday tried to clear his name and tout his record on Supreme Court nominations, calling Republican branding of his past remarks on the subject "ridiculous" and casting himself as a longtime advocate of bipartisan compromise in filling seats on the high court. In a speech at Georgetown Law School, Biden issued a broad warning that Republicans' election-year blockade of President Barack Obama's nominee "can lead to a genuine Constitutional crisis" and sought to distance himself from the strategy. He argued Republicans have distorted a 1992 speech in which he seemed to endorse the notion of blocking any Supreme Court nominee put forward in the throes of the election season. Republicans have labeled their strategy the "Biden rule." They are using the 1992 Biden speech in an attempt to cast their no-hearing, no-vote campaign as part of a Senate tradition — their defense to Democrats' charges that they're shirking their Constitutional duty. Biden, a former Senate Judiciary Committee chairman, said his broader point in the lengthy Senate floor speech was to call for more consultation with the Senate in choosing a nominee, a practice he said would lead to nominees with less extreme views. Obama "followed the path of moderation" in picking Appeals Court Judge Merrick Garland, Biden said Thursday. "There is no Biden rule. 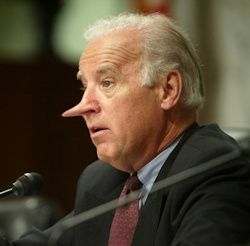 It doesn't exist," Biden told professors and students. "There is only one rule I ever followed in the Judiciary Committee. That was the Constitution's clear rule of advice and consent." Biden's defense focuses on a later section on the speech, in which he called on then-President George H.W. Bush and future presidents to work more closely with the Senate to name moderate nominees. Earlier in the speech, Biden warned that if Bush were to name a nominee immediately, weeks before the summer political conventions, "the Senate Judiciary Committee should seriously consider not scheduling confirmation hearings on the nomination until after the political campaign season is over." The remarks have proven problematic for Biden, a veteran of decades of Supreme Court battles. After more than 15 years on the Judiciary Committee, eight as chairman, few in Washington can match Biden's experience with judicial nominations. Facing perhaps the last big political fight of his career, the vice president has appeared eager to dive into a familiar debate. Biden, who has acted as a stealthy liaison to Senate Majority Leader Mitch McConnell in past negotiations, has begun some of that work. He has reached out to some Republican senators, and he has pressed the issue while campaigning for Democrats in Seattle and Ohio. His role is likely to increase as the process moves forward. Republicans won't make it easy. Immediately after Biden's remarks Thursday, Republican National Committee Chairman Reince Priebus issued a statement accusing Biden of hypocrisy. "The vice president's weak attempt to walk back his own standard on opposing election-year Supreme Court nominees just can't be taken seriously," Priebus said. "It is my view that if a Supreme Court justice resigns.....President Bush should consider following the practice of a majority of his predecessors and not name a nominee until after the November election is completed. The Senate too, Mr. President, must consider how it would respond to a supreme court vacancy that would occur in the full throes of an election year. It is my view that if the President....presses an election year nomination, the Senate Judiciary Committee should seriously consider NOT scheduling confirmation hearings on the nomination until after the political campaign season is over." "It would be our pragmatic conclusion that once a political season is under way....action on a Supreme Court nomination must be put off until after the election campaign is over. That is what is fair to the nominee and essential to the process. Otherwise, it seems to me Mr. President we will be in deep trouble as an institution." Say hello to another hypocrite. Barack Obama and top senate Democrat Chuck Schumer are already engaging in hypocrisy of the highest order by calling on senate Republicans to move quickly to replace the vacancy left by the sudden death of Justice Antonin Scalia. The GOP needs no further justification in choosing not to move forward on any nominee than Obama’s and his fellow Democrats’ own past words and actions. In 2006, while no doubt starting to lay his eyes on a presidential run, then-Sen. Obama had no problem throwing a wrench in the works of democracy by voting to filibuster George Bush’s nominee to the high court, Samuel Alito. In other words, because Alito did not share his judicial philosophy and he felt the judge’s ascension to the Supreme Court would not allow an independent check on the excessive use of executive branch power, Obama, in fact, voted to block the appointment. The bottom line here? only a fool would 'care a whit' about giving this nomination any consideration.